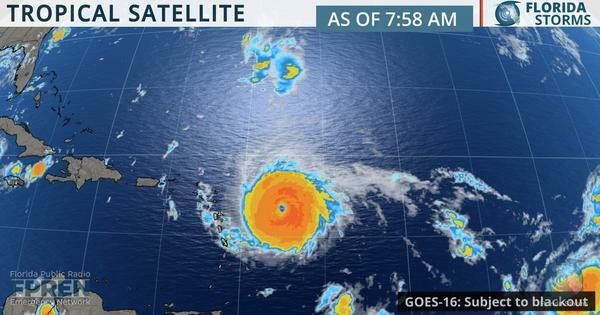 Labor Day weekend in Florida was a weekend of "watchful waiting" and preparation for what Hurricane Irma has in store. The storm is still several days out in the Atlantic, but water was in big demand in a South Florida Walmart in Miramar. On Labor Day it was packed with people trying to stock up on non-perishable food and other supplies. In the Tampa Bay region, water was also flying off the shelves and Floridians' omnipresent cell phones are tracking Irma. Mary Burrell with Pinellas County Emergency Management said Floridians should sock away at least a one-week supply of canned foods, like peanut butter and tuna fish, and have on-hand diapers, pet food and personal items, such as feminine hygiene products. 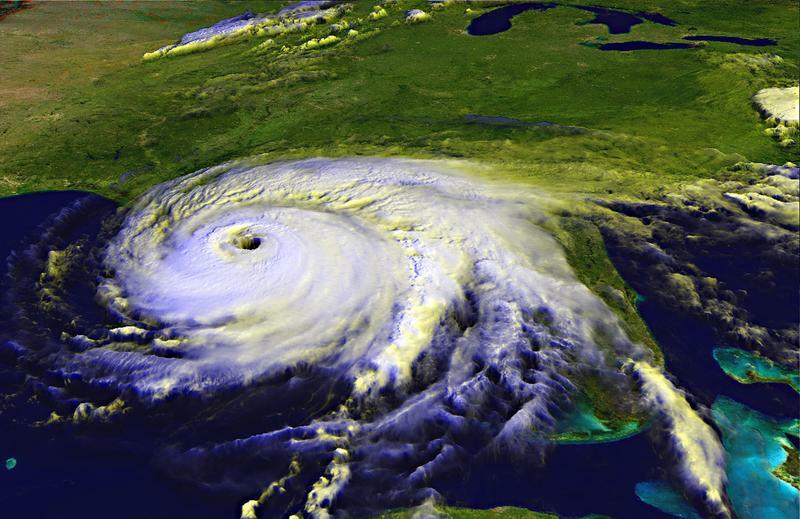 Many Florida Emergency Managers across the state intend to keep in touch via social media. But if power goes out during the storm, that weather radio may be your best friend. Plus, if you are depending on your smart phone, make sure you have a back-up power source at hand. Important documents, such as insurance, should be kept in a sealed plastic bag or waterproof container. Residents should also stock up on their medications, experts say. "And once there is a state of emergency, a lot of people don't know this, but you can refill your prescriptions without having to wait as the insurance companies usually make you do. And while you're there, ask your pharmacy for a printout of your prescriptions you take and how often you take them,"
Burrell says this will help you, and inform anyone who may need to take care of you. Residents can register for updates with their county emergency operations website. 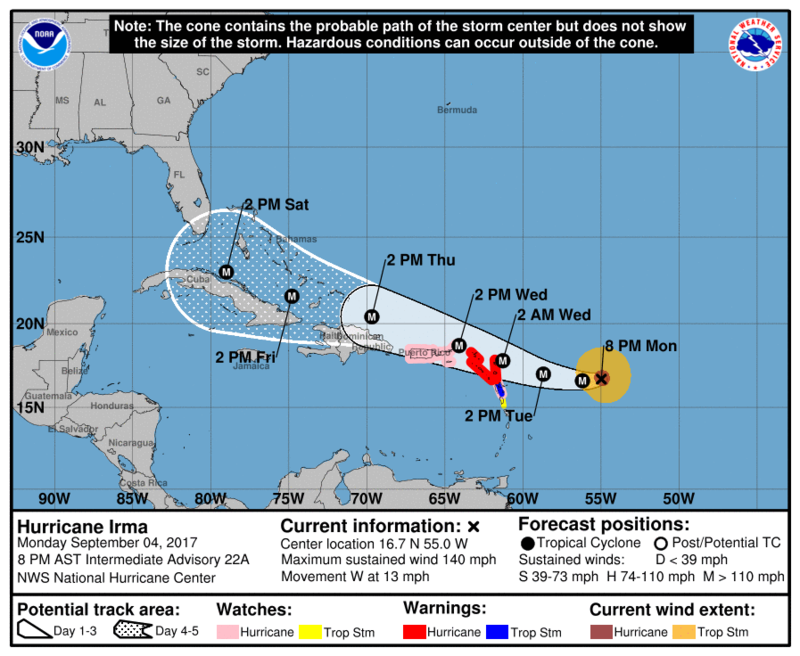 Irma strengthened Monday, and new forecast data suggests the major hurricane will approach South Florida this weekend. 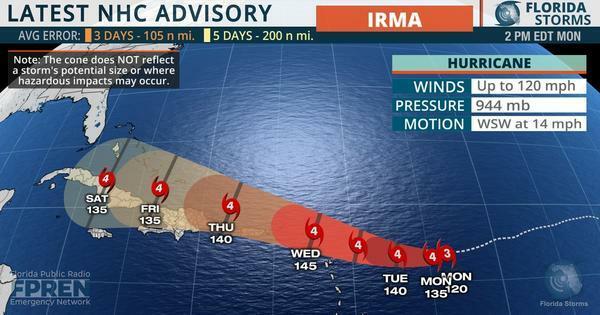 It was too soon to make or deny that call over the weekend, but confidence is increasing that the Category 3 storm will come very close, it not make a direct hit, on the Sunshine State in six to eight days.